The spring rally began in early March with the financial sector taking leadership and rising from a death spiral. 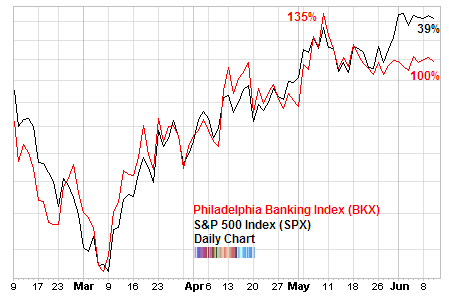 The Philadelphia Banking Index (BKX) rallied with such a ferocity that in about two months time it had more than doubled. In fact, by early May 2009, the financial sector had gone up by an astronomical 135%! Meanwhile, the wider market index, the S&P 500, had only managed a 35% increase. On its own, that was very impressive rally but it pales in comparison to the banks. But while the S&P 500 went on slightly higher in June, the financial sector as measured by the Philadelphia Banking Index (BKX) started to lag. This was the first time in many months that it didn’t move in lockstep with the general market. So if the Banking Index (BKX) has given up leadership, which sector is driving the market higher? Currently the Semiconductors (SOX) is going strong with Information Technology being the largest sector of the S&P 500 at 18.3%. As well, Transportation and Energy sectors continue to have relative strength. The question is, is this a normal sector rotation or does the weakness in the important financial sector mean that the market has lost an important leadership sector and will weaken as a result?